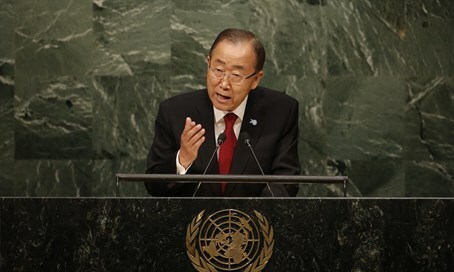 UN chief Ban Ki-moon condemns Israeli 'settlements,' but justifies murderous Palestinian terrorist attacks. UN Secretary-General Ban Ki-moon on Tuesday attacked Israel and expressed sympathy for Palestinian terrorism during a UN Security Council session. Ban condemned the presence of Jewish communities in Judea and Samaria, and specifically news that Israel plans to declare an area near Jericho as state land. "Progress towards peace requires a freeze of Israel's settlement enterprise," Ban told a Security Council meeting on the Middle East. "These provocative acts are bound to increase the growth of settler populations, further heighten tension and undermine any prospects for a political road ahead," said Ban. "The parties must act - and act now - to prevent the two-state solution from slipping away forever," Ban continued. In contrast, the UN chief appeared to excuse Palestinian terror attacks - on the same day as an Israeli woman died of injuries she sustained in a brutal stabbing attack yesterday. "Palestinian frustration is growing under the weight of a half century of occupation and the paralysis of the peace process," he said, blaming "the occupation" for causing "hatred and extremism." "As oppressed peoples have demonstrated throughout the ages, it is human nature to react to occupation, which often serves as a potent incubator of hate and extremism." Israel's UN delegation is to refute Ban's statement, which follows a harsh indictment of the UN Security Council by Israeli Ambassador Danny Danon, who noted that the UNSC has failed to condemn a single terror attack against Israelis in the past four months of Palestinian attacks.